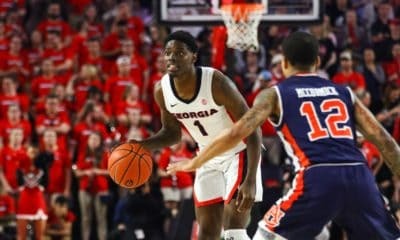 ATHENS, Ga. – The Georgia Bulldogs could not withstand a late-game surge by the Auburn Tigers, as Auburn rallied from a nine-point deficit to beat the Bulldogs 69-68 at Stegeman Coliseum on Saturday. 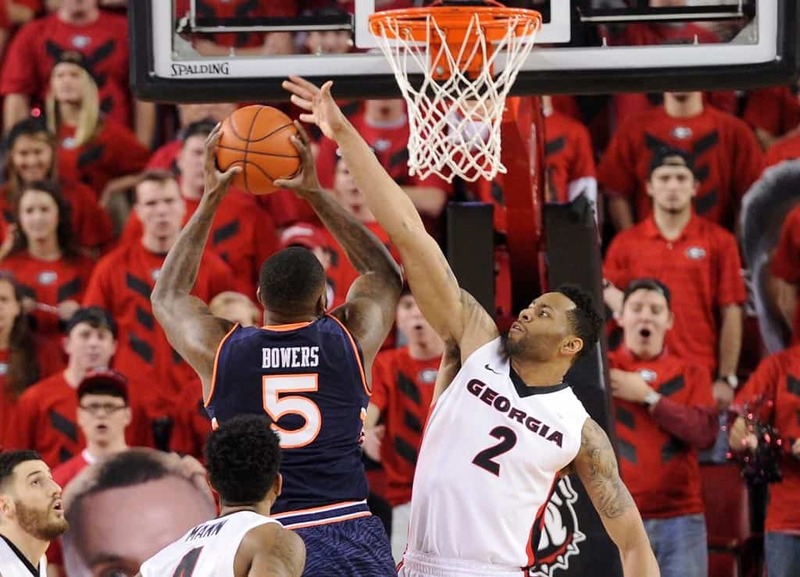 Auburn (12-13, 4-8) shot 56 percent from the field in the second half and scored 21 points in the final five minutes to overcome a nine-point Georgia (16-8, 7-5) lead. Georgia struggled from the field early in the first half, making just one of its first eight field goal attempts. Auburn jumped out to a 14-6 lead in the first seven minutes before cooling off and scoring just four points over the next seven minutes. The Bulldogs were able to get things rolling late in the half and took the lead on a Taylor Echols 3-pointer with just 46 seconds on the clock. However, after a Charles Mann turnover, KT Harrell hit a jumper as time expired to give Auburn a 29-28 advantage at halftime. Georgia hit its first two baskets of the second half to take a 33-29 lead before Auburn took a timeout and shifted the momentum the opposite way. The Tigers scored six straight out of the timeout and both teams continued to exchange blows for the next few minutes until the Bulldogs started a 15-4 run at the 13:10 mark which put them up 50-44 with under ten minutes to go. 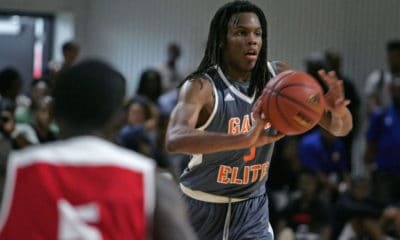 The Bulldogs kept the pressure on and took a nine-point lead with five minutes remaining on a Marcus Thornton put-back and subsequent free throw. The tides turned rather quickly after two consecutive fouls by the Bulldogs as Auburn rallied back to cut the lead to 63-62 with 1:42 remaining. Harrell hit a 3-pointer from the corner with 59 seconds on the clock to give Auburn its first lead since the 9:57 mark of the second half. Mann cut the lead to one on a layup with 29 seconds on the clock and had a chance to tie the game after Nemanja Djurisic got an offensive rebound after a missed three, but Harrell forced Djurisic to turn the ball over and was then fouled. Harrell made one of his two free throw attempts to put the Tigers up by four with eight seconds remaining. Kenny Gaines hit a 3-pointer to cut the lead to one with 1.8 seconds on the clock. K.C. Ross-Miller then threw the inbounds pass down the length of the court and out of bounds to turn the ball over and give Georgia a chance to inbound from underneath its own basket to win the game. The inbounds went to Djurisic who had to catch and shoot to get the shot off before the buzzer, but the 3-point attempt came up just short as the buzzer sounded. Gaines paced the Bulldogs with 18 points and Mann finished with 14 points as the only two Bulldogs that scored in double figures. Thornton finished the day with nine points and seven rebounds. Harrell finished with a game-high 21 points on 7-of-13 shooting and Ross-Miller finished with 17 points as the only two Tigers that scored in double figures. · Georgia’s starting lineup was: Marcus Thornton (82nd career start), Nemanja Djurisic (48th), J.J. Frazier (13th), Charles Mann (63rd) and Kenny Gaines (54th). · This was the 180th all-time meeting between the two schools, and the first of two matchups in the 2014-15 season; the series is now even at 90-90. · This was the first time Georgia had lost to Auburn in Athens since 2009. 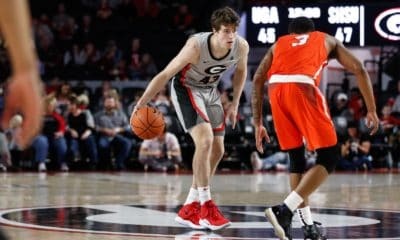 · Georgia had its second best performance form the free throw line of the season, making 18-of-21 attempts (85.7 percent). 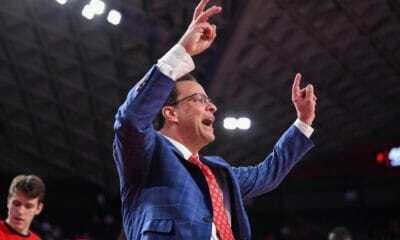 · The Bulldogs committed over 20 personal fouls for the ninth time this season. They are 3-6 when committing more than 20 fouls on the year. · The Bulldogs had their third worst performance of the year from behind the arc, shooting just 21 percent from deep (4-of-19). Georgia will look to rebound from Saturday’s defeat when South Carolina comes to Athens on Tuesday, February 17. The Bulldogs lost the first meeting with South Carolina 67-50 in Columbia on January 31. Tipoff is set for 7:00 p.m. and the game will air on the SEC Network.